Weekend Open Forum: Did you jump on the 3D bandwagon? A couple of years ago it seemed like not a day could go by without someone announcing something 3D-related. TV manufacturers raced to one-up each other with 3D-capable television sets, some requiring no glasses but offering poor viewing angles, while companies in the gaming world also worked -- and still do -- to offer stereoscopic 3D gaming experiences alongside the traditional 2D mode for those who want it. Hell, even Nintendo went all out launching the 3DS gaming handheld. 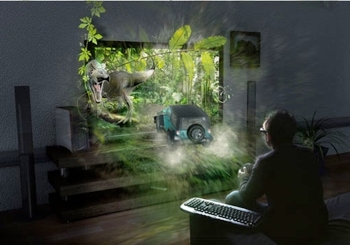 Fast forward to today and besides a few high profile movies showing in theaters, it doesn’t seem like much progress has been made to spur 3D's transition to people’s living rooms. In fact, only 2% of TVs in the U.S. are able to show 3D programming, according to the most recent data from research firm IHS Screen Digest. Those of us who live and breathe technology are often the ones taking the leap to buy the latest gizmos. So, today we want to know: did you jump on the 3D bandwagon at home? If so, do you regret your purchase? Also, tell us if you use it for gaming or movies, and how often you find yourself wearing your not-so-fashionable 3D spectacles.